Going Nutty! 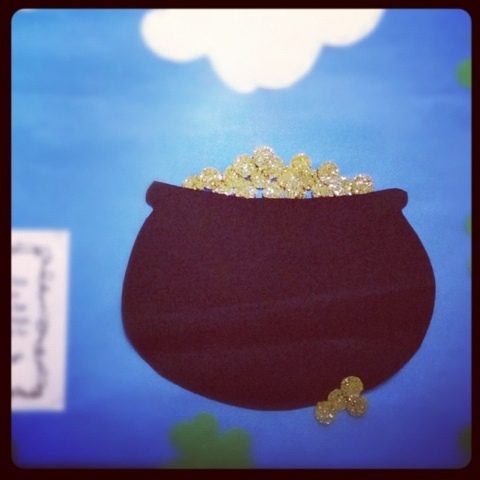 : Who Has Mr. Green's Gold???? It's Tuesday- do you know what that means? All this talk of St Patrick's Day coming made me feel like I was getting behind! So today I had them do a Math Task on our district template. It was a fun one. I showed them a picture of JW Illustrations Leprechaun and gave them a few minutes to discuss what we should name him. And finally they settled on Mr. Green. I know, right? He wasn't even in the running!?!??!? 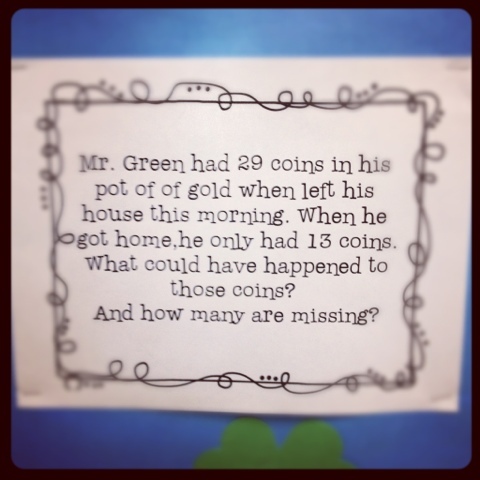 The math task was a "change unknown" problem- and I loved watching them solve it! 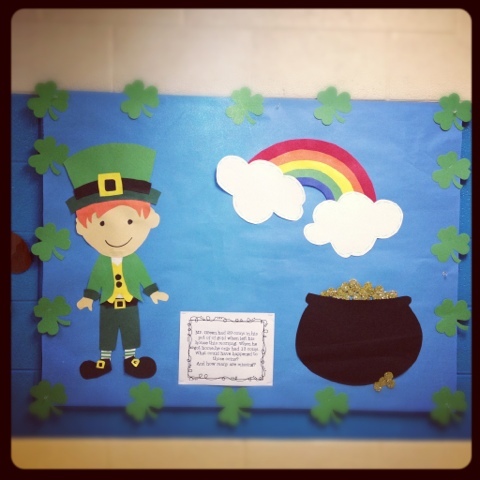 Mr. Green had 29 coins in his pot of gold when he left his house this morning. When he got back home there were only 13 coins. What could have happened to them? And how many are missing? The "stories" they are coming up with are great! They solved the math portion in a variety of ways. Some drew 29 circles. Colored the 13 that were left. And circled the 16 that was lost. Some started it out 29-?=13.....and dove right in. Some started with 13 red counters and started adding blue ones til they got to 29. As soon as their tasks are completed tomorrow they will move it out to the hall to live with 'Mr. Green" for awhile. I LOVE making displays! Love it! Check out this gold! I used my 1' hole punch to make yellow coins- but they were B.O.R.I.N.G. So I covered them in white glue and dipped them in glitter!! I am going to add a few more in the morning. I was pretty- after I get a few lil friends to make me some more. I may have a slight problem with this display thing. We do so much great stuff that I can't decide what to display and what to pass on. Prime example? This is my section of the hall as of 6:30pm this evening. 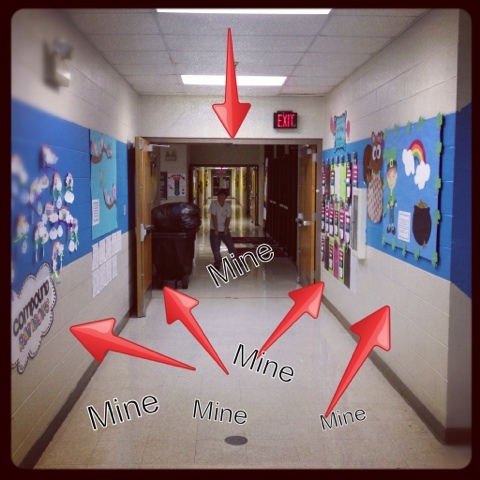 Check out all that is "mine". But see what I mean? The birds on the left will come down this Friday. And the Leprechaun Writing Craft we are working on will go where the Happy Birthday (to he who cannot be named) Cakes are. You may have heard me say before that EVERY PERSON in our school passes our room at least once a day. The cafe is just to the left of where I shot this pic. So they all have to pass it to get in- I like for the them to have lots to interest them while they wait. And my sweeties LOVE LOVE LOVE showing off what they do. They even stop and stare at the own work sometimes and hold up the line behind us!!!! Your stuff is so cute! !